Outside the CFPB today, consumer advocates posing as loan sharks “celebrated” Mulvaney, and then held a press conference with Congressman Don Beyer (D-Alexandria, Va.) to denounce Mulvaney’s anti-consumer actions. Watch the video. 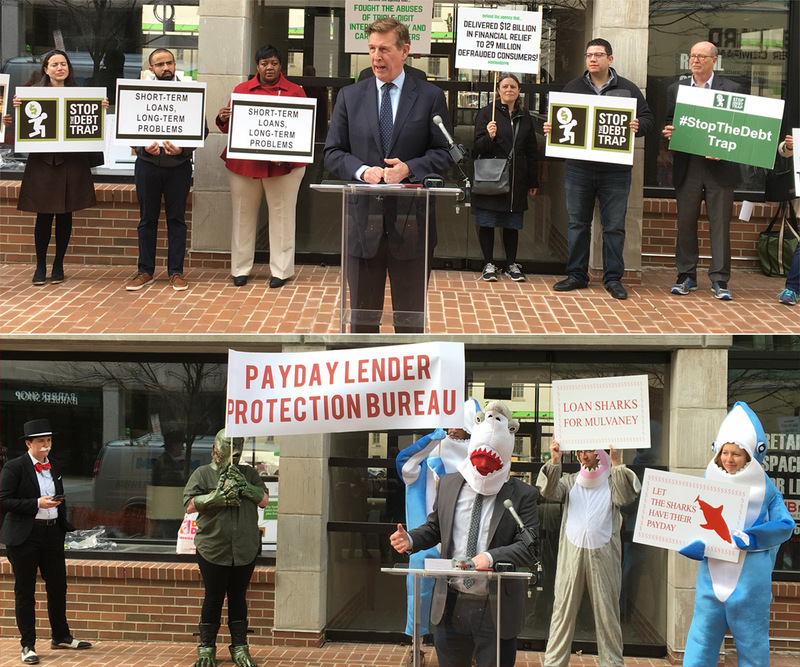 WASHINGTON, D.C. – Today, Congressman Don Beyer (D-Alexandria, Va.) and consumer advocates held a press conference calling for the Consumer Financial Protection Bureau’s (CFPB) acting “head” Mick Mulvaney to end practices that trap Americans in predatory payday loan debt traps. “As de-facto head of the Consumer Bureau, Mick Mulvaney has taken a wrecking ball to consumer protections. He is using the CFPB to undermine important rules that shield people from predatory payday lending practices. We need a director who understands the CFPB’s core mission, and will fight on the behalf of all consumers,” said Congressman Beyer. “Mick Mulvaney’s claim that he is protecting consumers from financial predators is ridiculous. Instead, Mulvaney is feeding consumers to payday loan sharks, going so far as to drop cases against debt trap lenders who broke the law and trap low-income Americans in a horrific cycle of debt. Mulvaney needs to go!” said José A., Payday Campaign Manager at Americans for Financial Reform. This “Stop The Debt Trap” campaign event is part of the nationwide Days of Action against predatory payday lending. Other events are being held in Illinois, Indiana, Maine, Montana, New Jersey, Tennessee, Virginia, and Wisconsin. Earlier this week, Senator Durbin and 42 other senators wrote a letter to Mulvaney questioning his actions in support of the payday loan debt trap.